My father was born in Winsum on the 30th May 1920, he went to the local school until the age of 13, it was possible to stay on until he was 14 but he wanted to work with his brother Eise in his father’s bakery. He was conscripted into the army but was only a full member for three days when Hitler invaded Holland at dawn on 10th May 1940. Most of his colleagues were forced to go to Germany to help the German war effort but as he was a baker he was allowed to remain in his home village working for his father until sometime in 1943, when Hitler ordered the bakers ovens to be sealed to conserve fuel, which was becoming in short supply. As part of Hitler’s efforts to eradicate the Jews, family histories were looked into and it appears this may have been the first time an Italian connection may have been found. He was also subjected to having his nose measured in a nose gauge, this was another method they had of trying to discover any Jewish bloodied. As it was he should have been transported to Germany when the ovens were sealed but instead went into hiding and joined the Dutch Resistance. His resistance name was Jochum and he carried false papers supplied by the resistance. During this time he spent three months under the pulpit of Winsum church, only coming out at night. He helped the resistance feed the Jews that were hidden in the area, as the Jews had no ration cards. When food was in short supply they would slaughter a cow in the fields at night belonging to any farmer who had collaborated with the Germans. At one time the local butcher had so much fat from these killings stored and hidden on his premises somebody informed the Germans and they had to hide the butcher and his family in an attic. He also assisted British airmen to escape and collected guns and ammunition dropped by the British to assist the resistance. A major job carried out by the resistance was the distribution of underground newspapers that were distributed all over Holland telling the Dutch people the truth about the war, there have been several books written about the importance of these illegal newspapers in keeping the moral of the people high. This work must have been hazardous as a German army camp was situated on the edge of the village. He came out of hiding when the Canadians swept through Friesland in April 1945. He arrived in the village on the back of a Canadian jeep on his fathers 60th birthday April 17th 1945. His father had just found the first peewit egg of the season, which was considered a local delicacy. The only real fighting in the area was during the liberation of North Holland and Friesland when there was a battle between the Canadians and the Germans just outside Herbayem; Three Canadians are buried in Franeker cemetery. Another wartime incident my mother can remember was some time in 1943 when the RAF carried out daylight bombing raids on Leeuwarden airport fifteen miles away, but some bombs fell in the Franeker and Winsum area. After the war mother and father wanted to marry, but due to the shortage of housing in the area they decided to look elsewhere. They answered an advertisement in the local paper, placed by a local doctors wife, on behalf of a British family known to the doctor. Following an interview with the doctor’s wife in Franeker they were offered the positions of cook and housekeeper to the Countess of Aylesford at Great Packington Hall, Meriden, between Coventry and Birmingham. 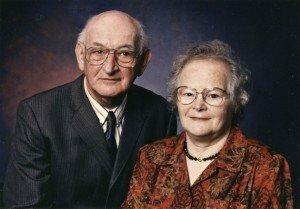 They married on the 7th May 1947 and left for England on the 16th June 1947. Their pay was £3 per week for both of them but board and lodgings were free. Soon after I (Oeds) was born on July 22nd 1949 the Countess suggested that as their were three mouths to feed she would not object if they sought employment elsewhere. By this time they had realised that their pay, which had remained the same, was grossly inadequate and took up a similar position in Bently near Ipswich for a member of the Tolley Cobbled brewing family. Following the birth of my sister (Gerbrig Ella) on 17th April 1953 and changes in the household we eventually moved to Coventry to take up the post of Verger/Caretaker at St. Margaret’s Church, Walsgrave Road, Coventry. During this period my father was selected to lead the Queen at the commemorative service to lay the foundation stone of the new Coventry Cathedral. In 1959 the family moved to Frome as Verger/Caretaker of St. Johns Church and Caretaker of St. Johns School. After 24 years at the school they took early retirement and in 1985 returned to Holland to live in the same town that they were married in and be closer to my mothers two sisters and brother and my Fathers Brother and Sister.